CARRIGALINE LIONS CLUB CHARITY WALK – Pictured leading off the Carrigaline & District Lions Club Charity Walk from Carrigaline to Crosshaven, in aid of the Irish Guide Dogs for the Blind and Cork Cheshire Home, were from left, Michael McGrath, TD ; Conor Tolan, Plant Manager, Pepsico ; Cork Hurler, John Gardiner ; Cllr. Sinead Sheppard ; Sean Duggan, President, Carrigaline & District Lions Club and Deputy County Mayor, Cllr, John Collins. 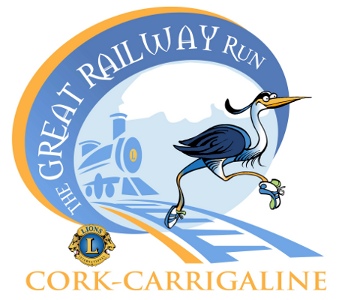 Over 350 people participated in this year’s Carrigaline & District Lions Club charity walk from Carrigaline to Croshaven which was a fun filled family day out. The walk was led off by a celebrity line-up pictured above. 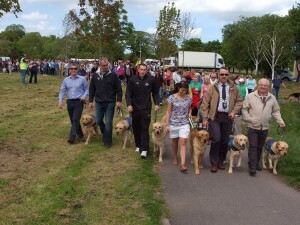 Before the start, they took part in a dog handling presentation, which was given by Guide Dog Trainers from the Irish Guide Dogs for the Blind, one of the main beneficiaries of the walk. Other beneficiaries included Cork Cheshire Home and the Carrigaline/Crosshaven walkway. The event was sponsored by PepsiCo and Ulster Bank and the official media partner was 96fm. There was a great asmosphere as groups of friends and families walked the beautiful walkway, some taking their dogs with them for this Sunday afternoon event. A host of free entertainment kept adults and children amused including face painters, a magician, a giant chess set, fire engine and a certificate for all participants. The entertainment kicked off at 2pm in People’s Park, Carrigaline with DJ Rockin Jerry. The 96fm Street Fleet were also in attentance. In the square in Crosshaven, there was a programme of entertainment from 3:30 until after 6pm with DJ Roy kicking things off, followed by a live band and closing with a perfomrance from the Owenabue Valley Traditional Group who had earlier provided entertainment along the walkway at Agamartha. 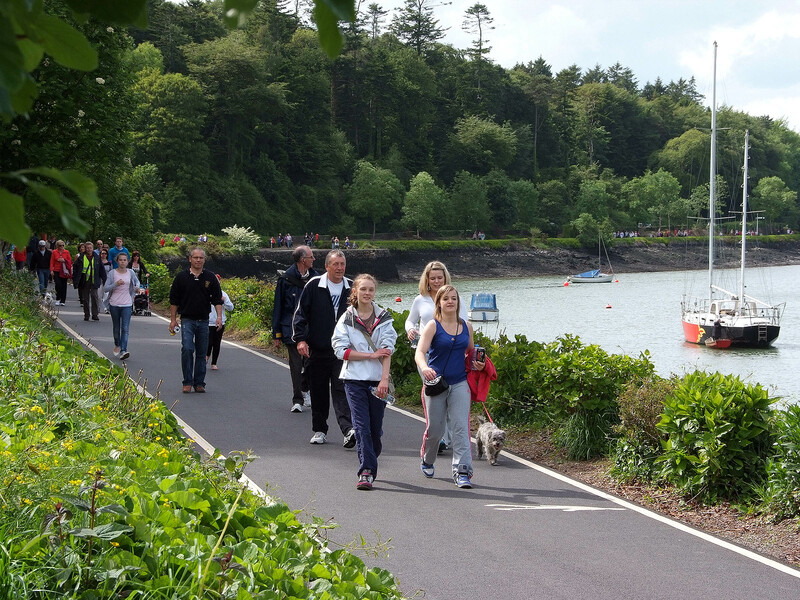 A free bus service operated between Crosshaven and Carrigaline to take participating walkers back to their cars. 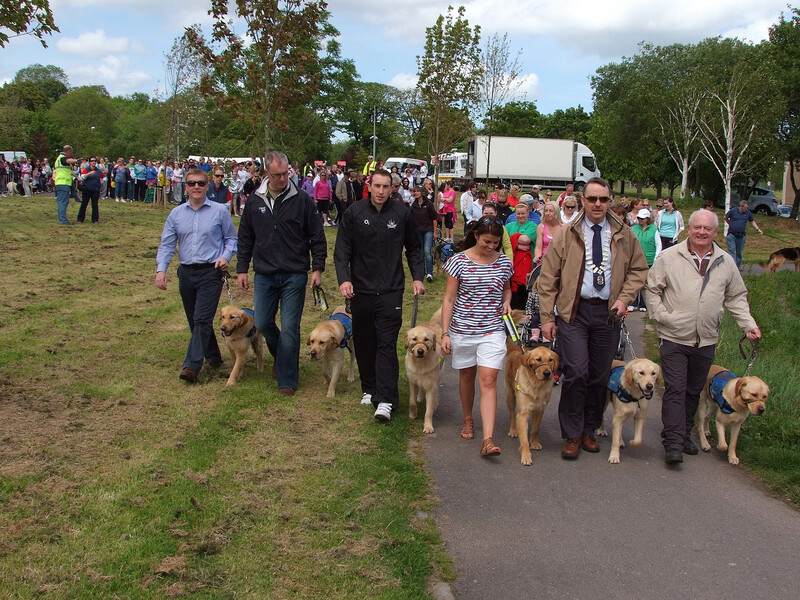 Walkers taking part & enjoying the scenery, in the Carrigaline & District Lions Club Charity Walk from Carrigaline to Crosshaven, in aid of the Irish Guide Dogs for the Blind and Cork Cheshire Home.